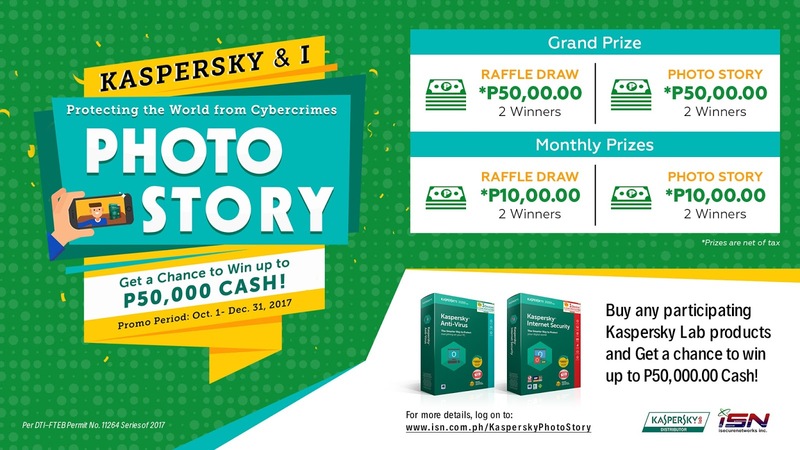 Be among the twelve lucky winners of a total of P280,000 worth of cash prizes tax-free just by securing your devices against cyberattacks with Kaspersky Lab and iSecure Network’s photo story contest. Dubbed as “Kaspersky & I, Protecting the World from Cybercrimes Photo Story Contest”, this promo aims to reward loyal users of the global cybersecurity company’s products nationwide. Eight winners of P10,000 each will be picked from each of the first two monthly draws while four grand winners will take home P50,000 each on the third and last draw. “Online security should now be on top of the Filipino minds after massive attacks like the Wannacry epidemic which showed how vulnerable we all are. The new versions of our flagship consumer suite are designed to give the best protection for our Filipino customers who are among the ardent users of Kaspersky Anti-Virus and Kaspersky Internet Security in the region,” says Sylvia Ng, General Manager at Kaspersky Lab Southeast Asia. “To thank them for their loyalty, we are also delighted to take our promo to another level by showcasing the Filipino’s photography skills while highlighting the importance of having a safe online environment,” adds Ng. This early Christmas treat from Kaspersky Lab and iSecure Networks is open to all Filipino citizens, 18 years old and above and will run from October 1 to December 31, 2017. 1) Via Facebook which requires liking the @iSecureNetworksInc page to access the Promo app and keying-in some details of the user and Kaspersky Lab product. 2) Via the promo website at http://mymegamobile.com/kaspersky/. It will require keying-in details about the user, Kaspersky Lab product and a verification code (to be emailed) to complete the registration process. Submitting a photo entry which can either be a single photo or a collage of photos with any participating Kaspersky Lab product in it. On a designated text field, provide a caption in English that answers the question: “In your own way, how can you protect the world from cybercrimes?” with 160-320 characters only. Keying-in the promo code printed on the activation card from the purchased Kaspersky Lab product. There are two chances for a customer to take home one of the 12 promo prizes. One is through a raffle draw where all entries will be electronically drawn and second is through the photo story contest that will be judged by iSecure Networks Inc. officers. Criteria for judging include Visual Impact (25%), Creativity (30%), Overall Impression (25%), and Content (20%). Photos with the top highest total scores will be declared as winners. Improved with updated security features, Kaspersky Lab’s Anti-Virus 2018, and Internet Security 2018 are both well-equipped with the latest measures that better safeguard users and those they value against the increasing cyberthreats against Filipinos. Specially marked Kaspersky Lab products are available at participating stores nationwide. For more promo information, please visit www.isn.com.ph/KasperskyPhotoStory.